On the first visit you will be greeted by our inviting staff as soon as you enter our office. If you haven’t already filled out our new patient paperwork that you can print from this website then you will be handed some to fill out at the office. The first visit is roughly 30-40 minutes long depending if x-rays are needed. You will see the doctor your whole visit. The doctor will do various chiropractic orthopedic tests, postural exam, spinal analysis, a digital nerve exam, and digital x-rays during this visit. If you are in extreme pain the doctor will also treat you on this visit to relieve your pain. Our first exam is very thorough and specific with the most advanced technology so that we know exactly what the diagnosis is. A typical office visits is a lot shorter then the first two visits, mostly ranging from 10-15 minutes. The adjustment takes only a few minutes to administer and depending if you need muscle work done to increase the healing the treatment time may be extended a few minutes. Once you enter the office you will be given a pin number to use to sign in on our paperless filing system, your file will be sent to the treatment room that you enter through our digital network. The doctor will then adjust your specific areas in your spine or extremities that need to be adjusted. After your adjustment the doctor will set you on our roller table so the adjustment holds longer and give you advice on stretches and exercises to do at home for better healing and answer any questions that a rise. 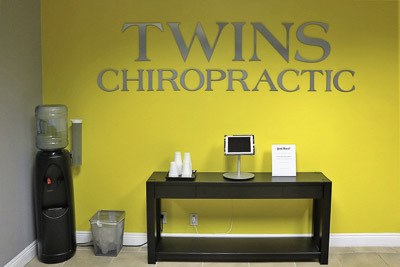 Please contact our Costa Mesa chiropractic office to schedule an appointment. We look forward to meeting you!